Most people who've run a satire site for more than a few months experience the (initially shocking) pangs of writer's block. For those who have been trying to keep their humor site acerbically pointed, relevant, and fresh for more than a couple of years, the condition is often chronic, and frequently leads to malaise, a change in format, or - most frequently - the writer walking away from his or her website. 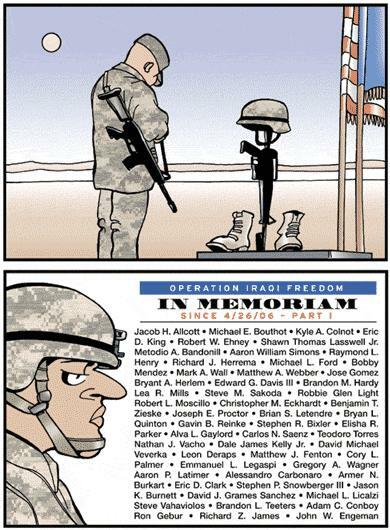 So can we blame Garry Trudeau, then, for tiring after nearly forty years? The Huffington Post calls him out for punch lines that have "grown less crisp" and a strip that is increasingly just not that interesting. Now, satire is basically an angry form of commentary. 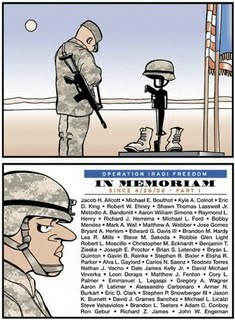 When, as Klein points out in the Huffington Post, the Iraq war came along and "Trudeau got pissed", one can make the case that, rather than jumping the shark, Doonesbury matured from a politically-oriented daily comic strip to one of the more compelling political commentaries of the day. (Don't take my word for it: many papers moved the strip to the op-ed page, or dropped it altogether, as Trudeau tackled more and more political sacred cows.) But good satire must be sharp, and it is hard to maintain one's edge indefinitely. Perhaps however it isn't fair to Trudeau to deem Doonesbury past its prime - instead, maybe we need to adjust our expectations for the strip. Likewise, the fact that Trudeau is still getting people to talk after so long should be heartening for webmasters struggling to keep their sites alive. None of us has been online as long as Trudeau has been drawing. It's worth looking beyond the fatigue to see how we can continue to evolve. If he can do it for nearly four decades, surely we can come up with a way to remain fresh and relevant for longer than a year or two.